I’ve been using a Fitbit for over two years. I originally purchased it to track hiking mileage but quickly started wearing it every day. Although I have enjoyed the weekly stat updates from Fitbit and definitely watched my steps on a daily basis, I have rarely used the social media aspects of the device. I had a couple of Fitbit Friends, but not too many interactions with them. Last week I was invited to participate in my first Fitbit challenge called a Workweek Hustle. Total steps — Five days — Monday to Friday. Usually I say no to things like this because I don’t want to bother and am mostly self-motivated when it comes to reaching my fitness targets. But I figured I might as well give it a try even if I wasn’t sure what my goals were for participating. Cherise of DCAF/DSMA was the organizer and most of the participants were diabetes types. When the challenge started, I was still in Arizona where I am a step-monster walking the dog, hiking, biking, playing golf, and enjoying easy access to the outdoors. I flew back to Minnesota mid-week and although I keep the same goal of 10,000+ steps/day here, it sometimes take more planning to get to my target. Because there is always social media trash-talk when you get into contests like this, I had fun from the beginning. On the first day I learned from Kerri that Ben (whom I didn’t know previously) was very “steppy” and she wasn’t kidding. From the beginning his step count was in the stratosphere and he ended up winning the challenge with a 5-day total of 176,727 steps (35,345/day). I don’t know whether he is a runner or walker fanatic, but using my steps/mileage ratio, he clocked in at least 16 miles a day (probably more because his stride might be longer than mine). Kerri was not too shabby with a 5-day total of 143,457 steps (28,691 steps /~13 miles) per day). She was focused on beating Ben up until the end. Kerri and Ben were so far ahead of the pack that I didn’t compete with them; I just marveled at their statistics. The group itself had a big range of results, but we were all winners as the ten of us totaled 768,205 steps (~350 miles) for the week. I won. I lost. But I won. Here is a link to Cherise’s video. I don’t know whether you have to be a member of Twitter or a follower of @SweeterCherise to view it, but give it a try. On my laptop and desktop, the link works fine. On my iPad, I have to click the Tweet below the photo and then on the next screen, click on the arrow/TV icon on the upper right of the screen. One of my next blogposts will be my views on how Fitbit and other step/fitness trackers can be a helpful, fun, and motivating part of your diabetes/general health regimen. That sentence sounds awfully preachy, but I promise (hope!) that the post will be better than that…. In Part 1 of this series, I discussed how the Animas Vibe performs poorly as a system in real time. Although the pump and continuous glucose monitor (CGM) are housed in the same hardware, the menu system often strands the user in no-man’s land where it is cumbersome to switch between CGM and insulin delivery functions. The CGM works as advertised but just not as well as the actual Dexcom receiver. The pump does its job of delivering insulin safely and reliably but doesn’t interact with the CGM except through annoying calibration alerts. It’s all okay; it’s just not great and the CGM and pump don’t add much value to each other. Today’s post is my impressions of the Vibe as a CGM. For the first month after I received my Animas Vibe, I used it exclusively as my CGM. The pump/CGM combo had some definite benefits, but the shortcomings drove me crazy and I went back to using my Dexcom receiver in Week 5. Rather than write a totally grouchy post, I will highlight some of the positives of the Vibe followed by my reality with those features. The Positive: The Vibe is the first insulin pump to be paired with the Dexcom G4 Platinum CGM. The Reality: My transmitter communicates well with the Vibe which is a reliable CGM receiver. Unfortunately by the time the Vibe was FDA-approved in November 2014, Dexcom had already released the 505 software update which will not be available to Vibe users. Looking at hardware, the Vibe was approved and ships with the 1st generation G4 transmitter despite the fact that the new low-profile transmitter is compatible. The highly anticipated G5 transmitter which will send data directly to a cell phone will not be compatible with the Vibe. The Positive: I like having one less device in my pocket when I leave the Dexcom receiver at home. The Reality: The software/hardware weaknesses of the Vibe result in a CGM device that is inferior to the Dexcom receiver. Some of the problems that I will discuss are small screen size, sluggish population of BG graphs, and multiple menus to navigate when shifting from CGM to pump functions. The Positive: I appreciate one-button access to the Data Screen which displays my BG number, the directional arrow, and my insulin-on-board (IOB) number. The Reality: The button is not a dedicated CGM button. When I am in the pump or CGM menus, it changes function and adjusts the brightness of the display. I hardly ever change the screen contrast and would prefer the ability to return to the CGM at any time with a one-button push. The Positive: The Vibe has a color, easy-to-read display. The Positive: The Vibe is waterproof and has been a rugged device for me as was my Animas Ping. The Reality: That is my reality and kudos to Animas. Although I have not been using the Vibe CGM concurrently with my Dex receiver, I did so last week in anticipation of a Friday hike with numerous water crossings. It was a relief to leave the non-waterproof and more fragile Dexcom receiver at home. Although the transmitter signal is not necessarily reliable while swimming, it is a great option to have the ability to monitor your BG when in and out of the water. The Positive: The Vibe has customizable alarms for low and high blood sugars. The Reality: Some people prefer the Vibe alerts. Others prefer the Dex alerts. Some like having both devices active, especially at night. I don’t have a preference and miss very few alerts on either device. The Positive: You can download the Vibe to Diasend and see your pump and CGM data in compilation reports. The Reality: The reports are great and contain the same CGM data that a download of the Dexcom receiver provides. Unfortunately It is incredibly slow to download the Vibe. You need to unhook and suspend the pump and then use the awkward dongle device to send data to Diasend. I have an old Windows computer and the Animas download rarely works quickly for me. It usually takes five to seven minutes for a successful download. In comparison I can reliably download my Dex receiver to Diasend in 45 seconds. **** The CGM graphs are very slow to populate. Rather than pop up immediately, each graph appears as though someone is drawing it. After viewing the Data Screen as my starting screen, I like to see the 3-hour graph. I have to watch the 1-hour screen populate and then wait for the 3-hour graph to draw. The next time I push the CGM button with the pump in sleep mode, it will start with the screen I left off on during my previous session. So if I want to start my next session with the Data Screen, I have to go through the complete cycle of graphs (1-, 3-, 6-, 12-, 24-hour) or go back the way I came (1-, 3-, 1-hr) to return to that screen before the pump times out. Because of the tedious refreshing of the screens, I tend to stop looking at the graphs on the Vibe and stick with the Data Screen. Essentially I start using my CGM in static mode. I see the BG number and directional arrow but have none of the historical context provided by the graphs. **** A second problem with the Vibe CGM is that the display is small. The Dexcom receiver has a landscape rectangle screen. The black window of the Vibe appears to be a landscape rectangle until you see that the active part of the screen is square and actually a bit taller than wide. When you combine the small size of the graphs with the fact that the hatch marks have no time labels (for example 10AM, 8AM), it is difficult to interpret the graphs. The length of the BG tracing (not including the graph axis) on the Dex receiver is 1.5 inches. The length of the same line on the Vibe is .8125 inches which is just slightly more than half (54%) the width of the Dex. **** A third problem with the CGM functions of the Vibe is that when I wake my pump through the CGM button, I am then in “no man’s land” in relation to the rest of my pump functions. From the Data Screen, I can either use directional arrows to see CGM graphs or press the OK button which takes me to the CGM menu. If I want to get to the Main Screen of the pump to bolus or adjust basal, I need to scroll down through the entire CGM menu before I can select the Main Menu. **** A final problem is that the navigation of the CGM functions seems to ignore which features are more important and used most often. When I get an alert for a low or high blood sugar, it doesn’t display the number. I need to push OK to acknowledge the alert and that sends me to the CGM menu. It then highlights the top line which is BG Calibration. I then scroll down and select Trend Graphs to view my BG number. What is a one-button push on the Dex receiver is now a 3-button push. When you’re low, bg calibration is low priority! **** One Vibe alert that I hate and am not able to silence is the calibration prompt. When the CGM is active and I input a blood glucose reading as part of a bolus calculation, it asks if I want to use the reading to calibrate. Although I can ignore the alert and it will time out, it always beeps. Originally I had my “Other” alerts set on vibrate, and this screen resulted in a series of four(!) vibrations. Since it is only one beep when I have it set on low, I don’t quite understand the four vibrations. Although a twice daily calibration is important for accurate CGM performance, the Vibe seems to give it unwarranted attention by placing it at the top of the CGM menu and then not allowing the elimination of the audio/vibration alarm. At the moment I expect that I will continue to use the Dexcom receiver and leave the CGM turned off on the Vibe. At the same time I appreciate the option to use the Vibe as a CGM and will occasionally use it for vacations, water activities, or when I want one less thing to carry. Maybe over time I will change my mind. If you are considering the Vibe, a great blogpost to read is by a Canadian T1 athlete who did change his mind and is now using the Vibe exclusively. As much as I believe that Animas should have gone back to the drawing board before releasing a pump/CGM combo in the USA, it is still good to have another tech option for people with diabetes. Stay tuned for Part 3 of this series where I evaluate the Vibe as a standalone pump and discuss how it differs from its predecessor, the Animas Ping. I have been using the Animas Vibe for two months. I believe that the decision to upgrade from my two-year old Ping was a good one and I am content that this will be my pump until the warranty expires in November 2016. The basis of this satisfaction surprises me because the reasons I like the pump have little to do with why I thought I wanted it. I am writing a 3-part series about my experience. Today will be an overall report card for the Vibe, primarily discussing whether it makes the grade as a pump/CGM system. Part 2 will be an evaluation of how the Vibe performs as a CGM receiver. Part 3 will be an evaluation of the Vibe as a stand-alone pump. In November 2012 I made the decision to purchase the Animas Ping because it was in line to be the first pump integrated with a Dexcom CGM. Despite poor results with the Medtronic SofSensors, I had really liked the integration of CGM data into my Revel pump. After using a Medtronic pump along with a Dexcom CGM for several years, I strongly believed that I wanted a single device merging my insulin pump and CGM. When the Vibe was finally released in January 2015, I began to question the wisdom of following through with the upgrade. I was concerned that the CGM software was already out-of-date, that future Dexcom transmitters would lack compatibility with the Vibe, and that I might have insurance problems getting a new CGM system because the Vibe functions as a CGM receiver. After meeting with an Animas Rep in early February, I made the decision to follow through with the upgrade. You can read about that decision and my early impressions of the pump here. After two months, I am happy with the Vibe as a pump, but I am back to using the Dexcom receiver full-time. In my opinion, the Vibe gets a poor grade as a SYSTEM in real time and earns a good grade in reviewal made. To clarify, the integration of the CGM into what is essentially an Animas Ping pump is clumsy and occasionally nonsensical when it comes to the decisions/actions that I make with my pump and CGM on a daily basis. It is difficult to move from the CGM functions of the device to the insulin pump functions. Unlike the Medtronic “system”, there is no meter that sends BG numbers automatically to the pump. At the same time because I can download the Vibe to Diasend along with my BG meters, Dexcom receiver, and now even my Fitbit (! 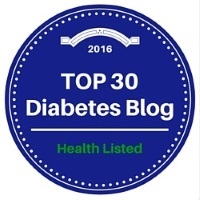 ), I have a great platform for merging and reviewing my diabetes and health data. In a January review of the Vibe, Mike Hoskins of Diabetes Mine mentioned that his Animas trainer talked about the Vibe “in terms of a dwelling — the two components used to be separate housing units, but now they co-exist under the same roof and are more like different rooms within one big home.” That is a great image, but I take it even further to say that the Vibe is a duplex with the pump in one unit and the CGM in the other. They are adjacent to each other, but they have separate entrances and there are no adjoining doors. To get from one device to the other, you must go outside and walk down the sidewalk to the other side of the building. Rather than adding value to each other, I find that the CGM part of the Vibe makes the pump functions more cumbersome than they are when the CGM is disabled. The only time that the Vibe works well as a system is when all of my devices have been downloaded to Diasend. In reviewal mode, it is a success because I can see reports merging pump and meter data with my CGM. Unfortunately it is time-consuming to download everything (especially the Vibe) to Diasend, so it is unlikely that I will do this frequently. I am starting to get a little cyborg excitement envisioning an Apple watch showing real-time Dex tracings, Fitbit steps, and insulin pump data. A brave new world for sure and definitely not what the Vibe delivers. In the next post in this series, I will write about how the Vibe functions as a CGM device and talk about what I consider some of the shortcomings of the Dexcom integration. Part 3 of the series will highlight my views on the Vibe as a stand-alone pump. As a hint of what is to come, I like the Vibe as a pump. At the same time, I have become comfortable with the idea that longterm my CGM data is going to end up on my phone, Apple/Pebble watch, or some other device. Unless the CGM integration improves the function of the pump and does more than be a poor replacement for a Dex receiver in my pocket, a pump/CGM combo doesn’t seem to add much value to my diabetes life. Today’s blogpost is one photograph. I hope that it will bring a smile to your face, especially those of you in northern areas which are stumbling towards spring. This small cactus in my back patio area is a Trico Cereus hybrid. It blooms during the night and each bloom lasts only one day. To provide some scale to the photo, the tallest part of the cactus is 24 inches and the diameter of each bloom is 9 inches. So enjoy the beauty, albeit fleeting.